Which patents have expired and are in the public domain. Which patents can still be resurrected. Which patents are currently in their grace period. What is the abandonment behavior of Company XYZ, in which classes, and how has it changed over time. Predict, to the penny, future fees required to maintain a portfolio, and when the payments will be due. To take advantage of the power of MDATE, a little background is required. US utility patents must be maintained three (3) times during their lifetime. Maintenance payments are due at the Patent Office exactly 3.5, 7.5 and 11.5 years after the patent's issue date. If no maintenance fees are received, the patent expires on years 4, 8 and 12 respectively. The 6 month period after fees become due is called the grace period, and patents may be renewed with no questions asked by paying a late fee in addition to the normal maintenance fees. The standard late fee as of 2017 was set at $160.00. Small and Micro entities receive the same percentage discounts on their late fees as they do on their maintenance fees. The USPTO will not accept maintenance payments more than 6 months prior to their due date. Therefore, the earliest you could pay the first maintenance payment on a patent granted on 03/20/2013 is exactly three years after the grant date, or 03/20/2016. 03/20/2016 --> The earliest you can pay the first maintenance fee. 09/20/2016 --> The latest you can pay maintenance fee without a late penalty (beginning of the grace period). 03/20/2017 --> The patent expires if no maintenance fees are paid (end of the grace period). AcclaimIP receives and processes maintenance fee information weekly from the USPTO. As payments are received, AcclaimIP moves the TRANCHE field forward from, for example, E1 to E2, and updates the MDATE field to the next maintenance date, or to the full term date, depending on where the patent is in its lifecycle. The term (statutory or end-of-life or full term) expiration date is tricky to calculate, and the USTPO will not provide term expiration dates since they are often a matter for the courts to determine. The type of patent also determines when the patent term expires. So a utility patent, a plant patent, and a design patent may all be filed on different dates, but actually expire at the same time. To complicate matters, many patents are granted term extensions (a lengthened patent term) due to delays at the patent office or delays due to FDA regulations. Other patents are subject to terminal disclaimers (a shortened patent term), most often because they claim the priority date of an earlier patent. The EXP field code is used to search the Est. 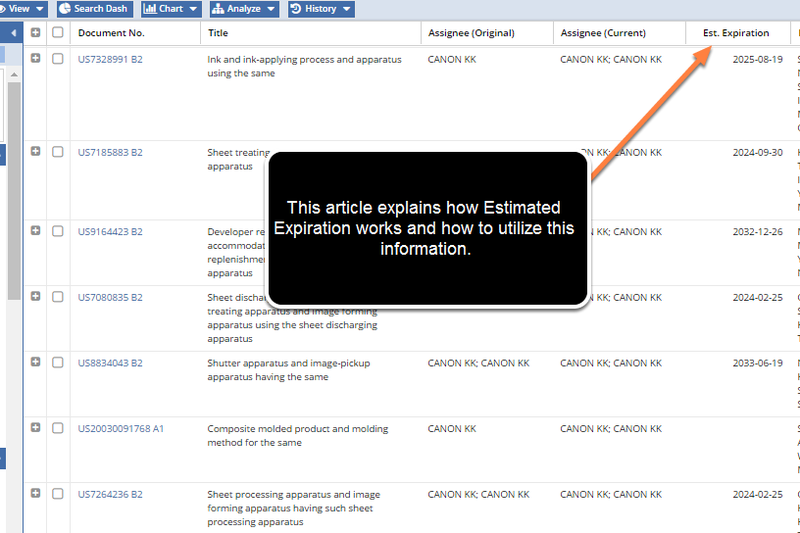 Expiration field, which stores the estimated expiration date of the patent (assuming it goes full term). The Est. Expiration field uses term extension data, terminal disclaimer information, and earliest effective filing date to come up with the most accurate estimated expiration date possible. The MDATE date field is dynamic, meaning that it moves forward through a patent's lifecycle. MDATE date is set to 02/18/2018 (Grant Date + 4 Years). Placed in the E1 renewal TRANCHE (the first renewal tranche). MDATE date moves to 02/18/2022 (Grant Date + 8 Years). Moves to the E2 renewal TRANCHE (the second renewal tranche). MDATE date moves to 02/18/2026 (Grant Date + 12 Years). Moves to the E3 renewal TRANCHE (the third renewal tranche). MDATE date moves to the Terminal Expiration Date (using 17/20 year math). Moves to the EX renewal TRANCHE (the terminal/statutory expiration tranche). The result is that you can determine when and where every patent has expired, been maintained, or will expire. The power of the MDATE and TRANCHE field codes is best explained by way of example, so let's go through some. In these examples I use range queries and the special date keyword NOW, meaning today. A range query uses square brackets and expresses one value (in this case a date) "to" another value. I also use the wildcard asterisk ( * ) which means any value (date). You could use explicit dates in your queries, but in many cases, using the NOW date variable will be more useful. Keep in mind, too, that these queries can be appended to ANY query you want to make. I suggest you try copy/pasting some of these queries into AcclaimIP, and you'll quickly learn how to use them. Expired patents have MDATE (AND EXP) dates in the past. Active patents have MDATE dates in the future. Patents in their grace period will expire within the next six months. They have not expired yet, but the maintenance payment is overdue. The reason I put the NOT TRANCHE:EX is that there is no notion of a grace period for patents approaching their terminal expiration date. Patent managers use this query to double-check that their annuities vendor has done its job and all patents matching this query are slated to be abandoned. If a patent matches this query, but should not be abandoned, they escalate their issues to their annuities team. Without this query, patent managers have little visibility with regards to maintenance, and sometimes important patents get abandoned. This could potentially cost the company millions of dollars. Patent brokers use this query to "dumpster dive" for potential treasures being abandoned by mistake, or because the entity cannot afford to renew patents. M&A executives use this query to look for signs of financial weakness. Distressed companies will often delay every possible payment to conserve cashflow, and start paying late. Note that you can explicitly query for late fees paid (and other maintenance events) using the EVENTCODE field code as well. For instance, EVENTCODE:M2555 would search for any small entity that paid the USPTO their 7.5 year maintenance fees late, but within the 6 month grace period. Product managers use this query to find technologies that they can add to their products without having to pay license fees. Note that I added "AND PT:U." This means "and patent type is utility" to remove design and plant patents from this search. The ISD clause limits the query to patents granted in the last 10 years. You don't need an expiration clause here because in these cases, the TRANCHE would have moved forward to 2014 if the maintenance fees had been paid. But because the TRANCHE did not move forward it shows the maintenance fees were not paid and the patents, therefore, have expired. 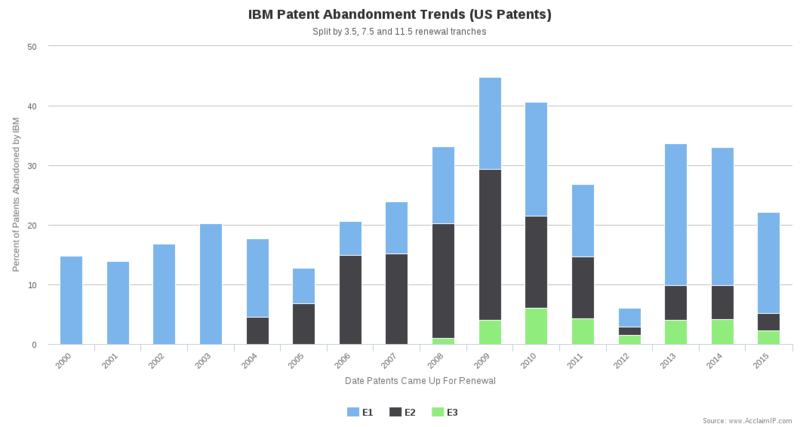 The Abandonment chart in this example uses the MDATE and TRANCHE from 2000 to 2015 to show what an assignee did each year as patents came up for renewal. In this case, I chose to split by tranche, because it divides the chart into the E1 (3.5 year), E2 (7.5 year) and E3 (11.5 year) renewal tranches. 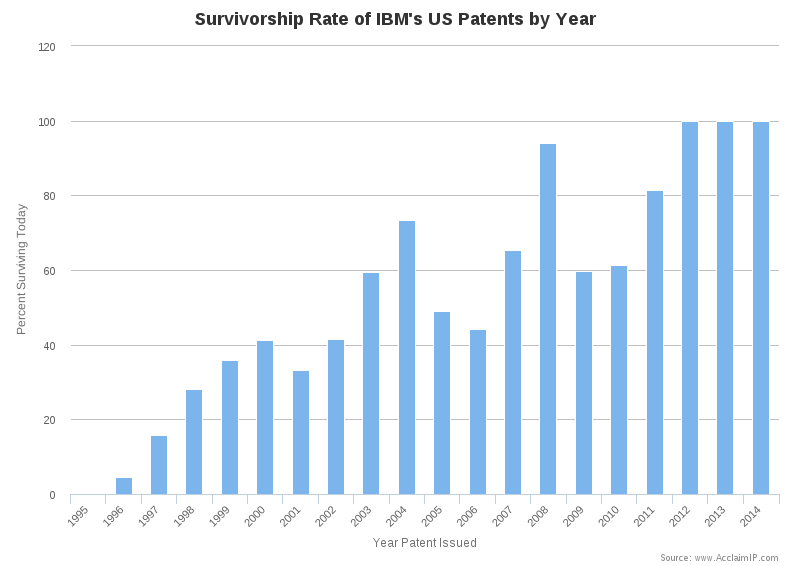 Another view that uses MDATE and TRANCHE fields is the Survivorship Rate Chart. This view shows the percentage of patents issued in a particular year survive today. Assume that it is 2015 and you are charting this this example. Notice that the patents granted in the most recent years all survive today since they have not had the opportunity to expire yet. In other words, since it's 2015 in our hypothetical, any patents granted in 2013, 2014, and 2015 would not have any maintenance fees due as of yet. So they are still in the E1 tranche and would not have been abandoned (except for in some exceedingly rare circumstances).